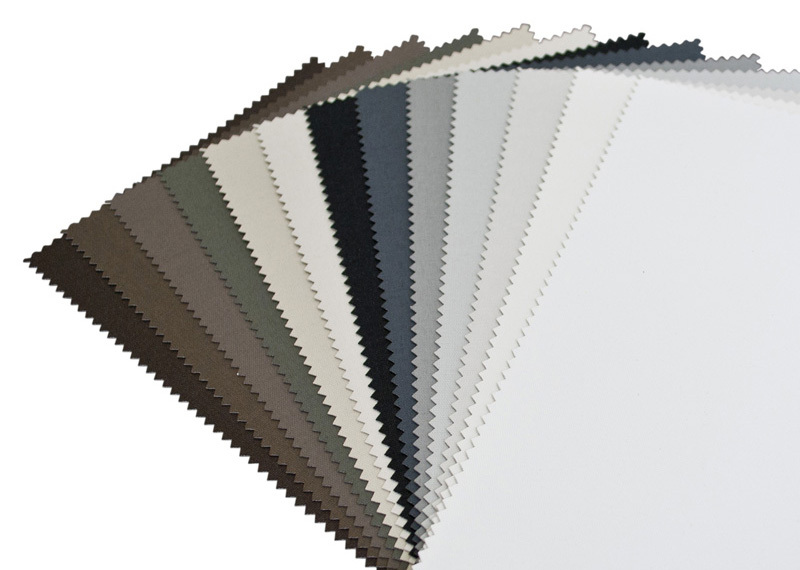 SunBloc is a range of blockout fabrics. It uses a polyester base cloth that is knife coated and acrylic backed with a floak coat. SunBloc is unique, as it has been colour matched to complement our Picturesque+ 4505 and 4303 sunscreen fabrics, as well as being available in a width of 320cm. It also has been anti-bacterial treated to inhibit the growth of mould and/or mildew. SunBloc is not FR rated. SunBloc has been integrated into the Copaco swatch because it has been colour matched to Picturesque+ 4505 and 4303 sunscreen fabrics. This creates a full suite of fabric and colour choices for the retailer and consumer. The Copaco swatch is available to manufacturers for their own use and/or for distribution to their retail customer base. There are no special considerations for fabricators when using SunBloc, except that good quality cutting techniques should be used. It is recommended that SunBloc is cut using either crush cutting or ultrasonic cutting machinery. Of course, the performance of the fabric will ultimately be determined by the ability of the hardware system to adequately support the fabric with minimum bending and general deformation of the roller tube, especially in wide width installations. SunBloc is available in cut lengths at a surcharge of $10.00 per cut. Cut lengths are generally despatched within two working days of order and are available for shipment to all parts of Australia. SunBloc is provided with a five-year manufacturer’s warranty for internal window applications, except when used not in accordance with the manufacture’s specifications.